An outbreak of Ebola virus disease has been ongoing in West Africa since March 2014. It is the largest outbreak known to date. Although low, the threat of importing Ebola virus disease cannot be excluded. Ebola virus disease has a fatality rate of 50% to 90%. 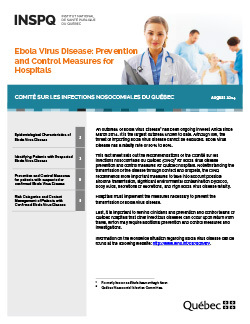 This fact sheet sets out the recommendations of the Comité sur les infections nosocomiales du Québec (CINQ) for Ebola virus disease prevention and control measures for Québec hospitals. Notwithstanding the transmission of the disease through contact and droplets, the CINQ recommends stronger measures to take into account possible airborne transmission, significant environmental contamination by blood, body fluids, secretions or excretions, and high Ebola virus disease fatality. Hospitals must implement the measures necessary to prevent the transmission of Ebola virus disease. Last, it is important to remind clinicians and prevention and control teams of Québec health institutions that other infectious diseases can be declared upon return from travel, which may require additional prevention and control measures and investigations. An updated version of this document is available: Ebola Virus Disease: Prevention and Control Measures for Hospitals - Update september 2014.